Offers Luxury, Excellence, Professionalism and FUN! Let’s face it—watching your favorite team play at home is a great way to spend your Sunday afternoon. As you and your family plans your trip to the next home game, you’ll quickly discover that the logistics of a day at the big game are a little more complicated than you anticipated. Specifically, costly parking fees and traffic headaches eat away at both your time, budget and fun. However, at Car Service Orange County, we offer affordable Rams games car services to the LA Memorial Coliseum that can deliver you to the entrance gates and put some of the fun back in your trip experience. 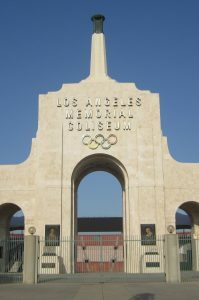 Let’s be honest—driving to the LA Memorial Coliseum is a long, stressful trip adding hours, expense and STRESS to your Los Angeles Rams experience. When you add parking fees, you budget only gets worse. While a car service seems like a splurge, let’s put parking into perspective; you’ll pay a substantial fee, waste time searching for a parking spot, and then you get to walk a very significant distance to reach the entrance. Why take all that time away from your family’s fun day when you can be delivered right to the entrance? Watching your favorite team play is exciting! After all of that fun, do you really want to re-navigate that crazy parking lot, then the traffic-filled roads of Los Angeles and Orange County? With our nonstop Rams games car services, you can sit back, relax, and truly soak in those memories. With all the effort and money you’re investing in your next Rams game, do you really want all of the hassles driving, parking, and walking, which will cost you time and lead to a frustrated family and much less fun? Car Service Orange County wants to help you make the most of your trip, and our LA Rams car services provide the perfect solution for you and your football family. No more hassles! Get to the next Los Angeles Rams game on-time and in comfort and style! skip traffic and parking costs while enjoying a stress-free ride with our private car services to the LA Memorial Coliseum for all Sunday afternoon Rams games this season. Avoid traffic nightmares and parking fees that can cost up to $100 in addition to gas costs and vehicle wear and tear. Are you ready to schedule your next LA Rams game? Contact our service representatives at Car Service Orange County and let us show you why we are a trusted provider of superior transportation services in Orange County.